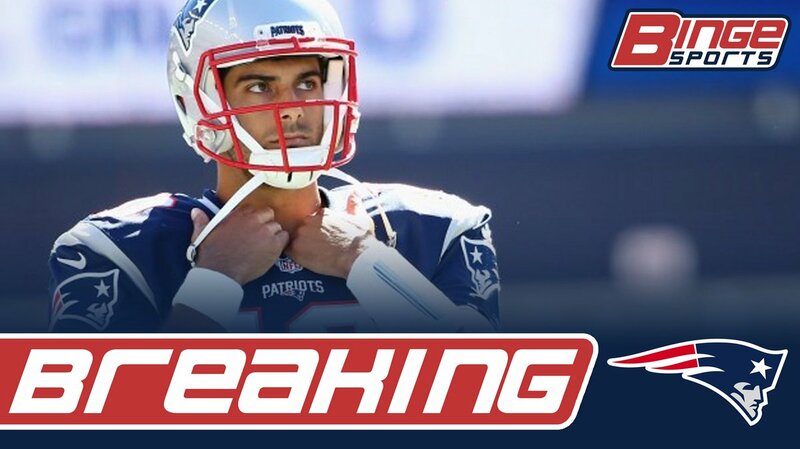 BREAKING: The Patriots Trade Jimmy Garoppolo To The 49ers For A 2nd Round Pick. 49ers and Patriots began talking trade Monday morning and, by tonight, the trade was officially agreed upon. Garoppolo to San Francisco. With Jimmy Garoppolo traded to SF, the Patriots now buying into the idea that Tom Brady can play well into his 40’s. 49ers owned two second-round picks but the one traded for Jimmy Garoppolo is SF’s original second-round pick, per source. Is this some kind of sick joke??? After all the rumors from this summer. To Belichick reportedly turning down more than one 1st round picks from the Browns. To the man who just broke the story, Adam Schefter, saying there is no way the Patriots were going to trade Garoppolo, not even for multiple 1st round picks. And now here we are, trading Jimmy Garoppolo to the 49ers for a 2nd round pick. It just doesn’t make any sense to me. We are talking about a man in Bill Belichick who covets value over everything. A guy who would trade away his son if he could get a good return on him. And what does he do? He trades away his young, valuable Quarterback for pennies on the dollar. If you were going to trade Jimmy, this summer was the time to do it. And when they did not trade Garoppolo during this summer there was no doubt in my mind that he was going to be on the Patriots for the whole 2017 season. That he would be backing up Tom Brady for the whole year and he would be franchised. Now, I wasn’t sure if they were going to franchise him to keep him or to trade him. But I believed that Bill wasn’t going to trade him for less than his true value and he wasn’t going to let him walk for nothing. What has changed since this summer? We already traded away Jacoby Brissett. Brady is banged up. Our team does not look as good as we thought it would have looked when everyone thought they could possibly go 16-0. Nothing has changed for the Patriots where I it makes more sense to trade them now instead of the summer when they could have gotten more for him. I am lost for words. We now don’t have a backup Quarterback. We now do not have a succession plan for after Brady. We traded away Garoppolo for less than what we should have gotten. Do you actually think that Jimmy isn’t going to make that 49ers team better? That they are actually going to be one of the worst teams? Because I don’t. I bet you the Patriots are going to get a mid-2nd round pick for Jimmy Garoppolo, which is much different than the #12 pick that the Browns were supposedly offering. My problem with this isn’t that we moved on from Garoppolo. While I would have liked Jimmy to stay in New England for the future and be the future Quarterback of this team, I understand that the timelines don’t match up perfectly because Brady continues to beat father time and play at a MVP like level. However, my problem with this is that they did not get good value in this trade. If Sam Bradford was traded last season for a 1st and 4th round pick, there is no reason why Jimmy Garoppolo should be worth a 2nd. I know the ‘In Bill We Trust’ crew is going to just look at this move and on, but I really hate this move. I hate the asset management that Bill has taken here. This is a bad trade and anyone who tells you otherwise is either basing it off of blind faith or just flat out lying to themselves.